If you are unfamiliar with any of the technical terms used on the site, or just need to refresh your memory, we have provided short explanations of many of the terms we use. Ancient Woodland: Land that has had continuous woodland cover since at least 1600 AD. It is subdivided into two categories: Ancient Semi-natural Woodland (ASNW) if the native tree and shrub cover is retained; and Plantation on Ancient Woodland Sites (PAWS) where the original native tree cover has been felled and replaced by planting, frequently with conifers. AONB: Areas of Outstanding Natural Beauty are areas of the finest landscapes of England and Wales, designated under the National Parks and Access to the Countryside Act 1949, specially protected to conserve and enhance their natural beauty for future generations. Biodiversity: Biodiversity encompasses the whole variety of life on Earth. It includes all species of plants and animals, but also their genetic variation, and the complex ecosystems of which they are part. It is not restricted to rare or threatened species but includes the whole of the natural world from the commonplace to the critically endangered. Brownfield Action Plan: Within Government’s Sustainable Communities Plan, these are to be developed by Regional Development Agencies and English Partnerships in co-operation with local authorities and other relevant agencies and statutory bodies, to guide the remediation and restoration of brownfield land for economic, commercial, residential and leisure uses. BTCV British Trust for Conservation Volunteers, The charity was set up in 1959, and has a successful history of environmental conservation volu nteering throughout the UK and around the world. Carbon sink: A forest acts as a carbon sink as long as it continues to affect a net transfer of carbon (in the form of CO2) from the atmosphere to the forest. Carbon footprint A carbon footprint is "the total set of greenhouse gas (GHG) emissions caused by an organization, event, product or person". For simplicity of reporting, it is often expressed in terms of the amount of carbon dioxide, or its equivalent of other GHGs, emitted. The concept name of the carbon footprint originates from the ecological footprint concept. The carbon footprint is a subset of the ecological footprint and of the more comprehensive Life Cycle Assessment (LCA). Combined Heat and Power: The production of usable heat and power in a single process at the point of consumption. It differs from traditional methods of power generation in that the heat generated in the production of electricity is captured and used for a variety of purposes such as industrial processes, district/community heating or space heating. Community Strategy: Part I of the Local Government Act 2000 places a duty on principal local authorities to prepare 'community strategies', for promoting or improving the economic, social and environmental wellbeing of their areas, and contributing to the achievement of sustainable development in the UK. Defra: Department for Environment, Food and Rural Affairs. Ecosystems: The interlocking nature of biodiversity along with land and soil, water and air. In effect the quality of biodiversity, both in terms of species and their habitats, determines the health of the natural world’s ecosystems. Ecological footprint: An internationally accepted concept, based on scientifically derived methodology, illustrating our environmental impact. The footprint represents the total land and sea area we use to produce food, energy and materials as well as the area required to absorb our waste. Estimated monetary value: The woodland wealth of the East of England has been estimated in 2010 to be annually worth £1.3 billion. For Market benefits table click here. Forest Education Initiative: A partnership between the Forestry Commission, Woodland Trust, Timber Trades Federation, Forest Industries Development Council, British Trust for Conservation Volunteers and Groundwork that aims to increase young people’s understanding of the local and global importance of trees, woodlands, forest environments, forest industry, timber trade and wood products industries. Forest School: A permanent, natural but safe setting in which children have freedom to roam and to experience the natural world through structured practical activities. GIS: Geographical Information System is a computer system capable of assembling, storing, manipulating, and displaying geographically referenced information. Greenhouse gases: Any gas in the atmosphere that absorbs and emits radiation within the thermal infrared range. This process is the fundamental cause of the 'greenhouse effect'. Common examples include water vapour, carbon dioxide, methane, nitrous oxide and ozone. Green exercise: Undertaking physical activity in a natural environment. GI: While there are many different meanings of the term Green Infrastructure in circulation, the Forestry Commission subscribes to the following definition: Green Infrastructure is a network of multi-functional greenspace, both new and existing, both urban and rural, which supports natural and ecological processes and is integral to the health and quality of life of sustainable communities. Landscape-scale: A holistic development approach over large areas potentially involving a number of projects. Such programmes are not confined to single issues but can embrace a wide range, including biodiversity, local economies and agriculture. Landscape Character Assessment: A technique that has been developed to facilitate systematic analysis, description and classification of the landscape. It involves identification of those features or combinations of elements that contribute to the character of the landscape, thereby enabling the special character and qualities of an area to be understood. LDFs Local Development Frameworks. Part of the Planning system for local authorities. Low-carbon options: A wide range of products, services and practices that offer reduced carbon consumption opportunities. Local Strategic Partnership: A single non-statutory, multi-agency body, which matches local authority boundaries, and aims to bring together at a local level the different parts of the public, private, community and voluntary sectors. MAG: Partnership responsible for the Woodland for life project comprising: Country Land and Business Association, COVER, Department of Health, East of England Local Government Association, East England Development Agency, English Heritage, Environment Agency, Forestry Commission, FC Regional Advisory Committee, Green Light Trust, Natural England, Norfolk County Council, RSPB, Suffolk County Council, Writtle College. NCF: National Community Forest, project to stimulate the development of community forests. Peri-urban: The urban fringe around the edges of towns and cities is a patchwork of multiple land uses, including housing, underutilised, derelict and agricultural land that can be converted into publicly accessible and valuable greenspace. Sequestration: In the case of carbon -the act of removing CO2 from the atmosphere and (in the case of trees) storing it in biological material. Silviculture: The science, art and practice of controlling the establishment, growth, composition, health, and quality of woods and forests to meet diverse needs and values of the many landowners and society. SPA: Special Protection Areas - areas designated under Article 4 of the European Community Directive on the Conservation of Wild Birds 1979 (EC79/409), commonly known as the Wild Birds Directive. They are intended to safeguard the habitats of migratory and certain particularly threatened species of birds. SSSI: Site of Special Scientific Interest - the main nature conservation designation in Great Britain. SSSI sites are special for their plants, animals or habitats, their rocks or landforms or a combination of these. SUDS: Sustainable Urban Drainage Systems - a sequence of water management practices and facilities designed to drain surface water in a way that provides a more sustainable approach than the conventional practice of routing run-off through a pipe to a watercourse. Sustainable woodland management: Generally speaking this is a resource management technique that seeks to make any harvesting or consumption of natural resources as sustainable as possible. It achieves this by replenishing any consumed resources, ideally as fast as they are depleted. While this goal may not be practical, sustainable management often helps to prolong the natural resource for as long as possible, such as fossil fuels. It is often easier to sustain resources that are considered renewable, such as woodlands and fisheries - hence sustainable woodland management and sustainable fishery management. UKBAP: UK Biodiversity Action Plan, published in January 1994 in response to Article 6 of the Biodiversity Convention, to develop national strategies for the conservation of biological diversity and the sustainable use of biological resources. It committed Government and its agencies to programmes or tasks: to conserve species and habitats; to develop public awareness and understanding; and to contribute to biodiversity work in the European and global context. To deliver the UKBAP three types of Action Plans have been developed which set priorities for nationally important and locally important habitats and wildlife - Species Action Plans, Habitat Action Plans and Local Biodiversity Action Plans. UKWAS: UK Woodland Assurance Standard developed jointly by Government and forestry, environmental and social interests for the independent certification of forest management. UKWAS is based on the UK Forestry Standard and enables timber sourced from certified woodland to access markets which are increasingly demanding credible independent assurance that timber products come from sustainably managed sources. Timber from UKWAS certified woodland can carry the Forest Stewardship Council’s internationally recognised label of sustainability. ‘Urban heat-island’: A built-up area that is significantly warmer than less densely developed or rural areas surrounding it. Veteran tree: A tree that is of interest biologically, culturally or aesthetically because of its age, size or condition. Wood pasture: Wood pasture is the product of historic land management systems. Typically, this structure consists of large, open-grown or high forest trees (often pollards) at various densities, in a matrix of grazed grassland, heathland and/or woodland floras. 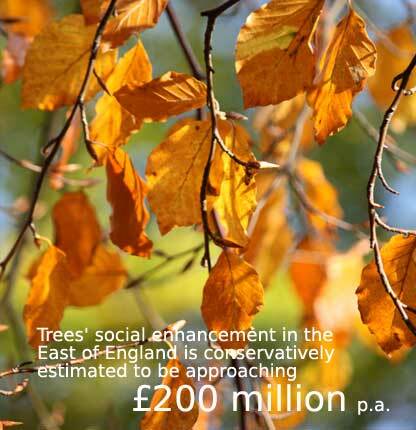 Woodland Wealth Appraisal: The 2010 estimate of the value of the East of England's trees and woodlands was published in January 2011.